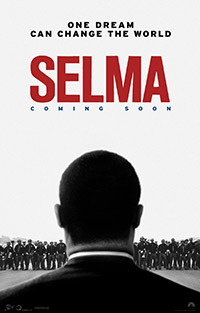 In director Ava DuVernay’s outstanding film, Selma, Martin Luther King, Jr.’s (David Oyelowo) heroism is absolutely palpable. In impassioned scenes of him orating, King is powerful, inspiring, motivating and even seductive. Viewers may very likely be tempted to call and respond to the screen as if in a church. So rousing are his speeches—such as one King gives after the senseless death of Jimmy Lee Jackson, an unarmed young African American man who is killed by a racist white cop—that it is impossible not to draw parallels to contemporary injustices. 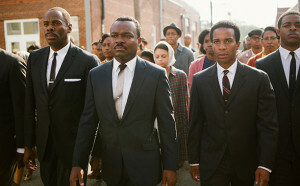 That Selma, a civil rights history film that never feels like a dull or preachy lesson, is still timely today is an added benefit to DuVernay’s tremendous accomplishment at dramatizing King’s story. Her film tackles a specific time and place in America, and chronicles the ripples and ramifications of King’s path-breaking march from Selma to Montgomery for the sake of voting rights. The film clearly delineates the people, events, and attitudes that informed the period leading up to President Lyndon B. Johnson (Tom Wilkinson) signing the Voting Rights Act of 1965. Even if they have only a few scenes, the points are made with care. Selma opens with King accepting the Nobel Prize for Peace in Oslo, in 1964. But he is motivated to fight—non-violently—for justice in America after the death of four little girls in Birmingham, AL. Other scenes depict Annie Lee Cooper (Oprah Winfrey, who co-produced) trying—and unfairly failing—to register to vote because of obstacles placed on her by white government employees. As King moves forward to go to Selma to stage a peaceful protest, the film shows how the FBI is monitoring his every move; the President prioritizes alleviating poverty instead of racial injustice; and J. Edgar Hoover is identifying King as a degenerate. Meanwhile, the Reverend is experiencing domestic tensions at home with his wife Coretta (Carmen Ejogo), and calling Mahalia Jackson (Ledisi Young) for inspiration. But it is King’s strength and wisdom that incites his followers, and generates the film’s spine. He insists that the protesters “negotiate, demonstrate, and resist” to get what they want. He articulates a salient point about equality: in the fight for the right to sit at the lunch counter, one needs to be able to buy the burger, (e.g, get/have a job), and have the education to read the menu. It’s one of the many pointed remarks in Paul Webb’s fantastic screenplay. Other poignant moments occur when King comforts the grandfather of the late Jimmy Lee Jackson, or when King takes a ride with Student Nonviolent Coordinating Committee member John Lewis (Stephan James) who recounts how King inspired him. DuVernay plays these key scenes with restraint, never milking the emotions, which is why the film is so moving. Moreover, the images in Selma—African American men lined up in the hope of getting justice, or white Southern cops lined up to do battle—are powerful, potent visuals. DuVernay, working with the extraordinary cinematographer Bradford Young, allows these shots to be impactful. Selma does not shy away from showing the horrific violence in critical scenes. The film makes these uncomfortable moments unsettling—as they should be. The anger an audience feels watching these tense and urgent episodes is just a fraction of what the real life individuals felt experiencing the injustice. This is one of DuVernay’s greatest achievements in her film: that she brings the history crisply to life. She is aided immensely by Oyelowo’s magnificent performance as King. He exudes the civil rights leaders’ humanity in voice, body language and gestures—never afraid to show vulnerability in private with his wife or strength in front of a crowd of strangers. It is a truly immersive performance, and helps make Selma such an astonishing experience. Selma opens today in Philly area theaters.